Yes is now without Jon Anderson again, and they manage to not fall flat on their faces with Fly From Here. Yes was my first rock concert. It was in the summer of 1991. If you had told me then that Yes would last for at least another 20 years, I wouldn't have known what to say. The prog rock collective was considered a dinosaur act even then, but this was before my 13-year-old brain could completely comprehend the strange revolving door that was the band's personnel. I used to be able to count how many guys had been in and out of the fold, but I lost track somewhere around fourteen. So, whenever a new studio album from Yes hits the market, most fans are just wondering who is handling the keyboard duties. I'll go ahead and tell you right now that for Fly From Here, it's Geoff Downes. But there's much more to the story. This is Yes' first album in ten years and their first one without vocalist Jon Anderson since 1980. Anderson suffered a series of asthma attacks in 2008 and the band's 40th anniversary tour was put on hold. Over time, Anderson grew apart from the rest of the band since he wanted to rest and the other guys really wanted to tour. Enter Canadian singer Benoît David who had fronted the Yes tribute band Close to the Edge for a number of years. With Anderson out of the picture and an anniversary to commemorate, Yes decided the next best thing to actually having their original lead vocalist was to have a sound-alike. David was even dressing like Anderson at this point, with bright colored vests and loose sleeves. Keyboardist Rick Wakeman, who had quit the band for the fifth time (I think), was actually replaced by his son Oliver. But as the touring band set their sights to recording, things get fuzzy. Oliver Wakeman was "dismissed" though some of his work for Yes' latest album survived the mixing process. But there's even more to the story: the Buggles. Trevor Horn and Geoff Downes, authors of the Buggles' hit "Video Killed the Radio Star", were quite the Yes fans. So much so that in 1980 they offered an original song to them called "We Can Fly From Here". Jon Anderson and Rick Wakeman had just walked away from the band and before Horn and Downes knew it, they were their respective replacements. This was a lineup shakeup that many fans couldn't swallow, and the resulting album Drama became one of the thorniest subjects of their discography. As good as Drama was, some people simply did not want to see Yes continue on without Jon Anderson. Yes quickly dissolved and the song "We Can Fly From Here", though performed at a handful of shows, was forgotten about. But with Downes now back on keyboards and Horn in the producer's chair, bassist Chris Squire, guitarist Steve Howe and drummer Alan White decided to resurrect the song in hopes of breathing new life into the beast that is Yes for the new decade. So if the multi-movement title track sounds like it's rooted in the Drama/Asia era of carefully aligned arena rock, that's because is. The 23-minute piece's overture has a steady rise and fall not unlike Drama's opener "Machine Messiah", making sure that every note and lyric serves its scene-setting purpose. There's something about this carefully-measured approach to writing extended progressive rock, one that flies in the face of the more organically-minded elastic forms of Tales from Topographic Oceans and Relayer, that feels slightly stifling. Then again, Yes hasn't had an album of new material since 2001's Magnification and this formulaic approach helps Horn and the band to retain their core sound, right down to Squire's fat thuds and Howe's stratospheric slides. And if Benoît David isn't a dead-ringer for Jon Anderson, he's very close. It certainly helps that the optimistic platitudes found in the lyrics faintly mirror the Anderson poetry of old, even if it comes in a more generic form: "Every day that you waste is once more that you've lost," "Turn yourself around / turn your life around / turn your world around / turn this ship around" and "I want to be the one / who always gives you shelter." Tolstoy in motion, it is not. Yes' extended works always promise to be more than a string of unrelated ideas, but just know that this isn't the "Gates of Delirium." The second half of Fly From Here is tame and unassuming by comparison. Howe's distorted power chords and White's tricky meters largely go into hiding on tracks like "The Man You Always Wanted Me to Be" and "Hour of Need", the former featuring Chris Squire on lead vocals during the verses. These songs are representative of Yes' purgatory state, one that flirts with concise pop forms but is afraid to fully commit to them. Squire's vocal delivery obviously comes from a personal place whereas Howe’s lyrics for "Hour of Need" are cynicism without a target -- ends justifying means, mouths to feed, so on, and check, please. 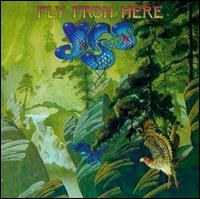 Fly From Here also marks one of the first Howe solo tracks to be used on a Yes album since 1991's Union. "Solitaire" (get it?) starts with andante Travis-picking, like a slowed-down "The Valley of the Rocks," and spontaneously moves into classical territory a la "Mood for a Day." Disjointed nature aside, it is a fine piece of nylon plucking that ranks alongside his other solo compositions. "Life on a Film Set" is another long-lost Horn/Downes tune that never got past the demo stage of the second Buggles album. Though it probably wasn't written with Yes in mind, it seems to fit the Squire/Howe/White approach like a glove even if the song isn't impressively memorable. It's with the closer "Into the Storm" that Yes sounds the most surefooted and perked. Steve Howe and whoever is playing keyboards (Oliver Wakeman holds partial copyright credit here) match on a theme centered on a broken chord, one that gives the song drive and the album some much-needed momentum. As far as the lyrics go, you can say that humility has finally arrived to Yes: "One thing I learned from all these years / as stupid now as we were at first / maybe that's the way it goes / when you try to change the world." Fly From Here is not a disaster. It has too much enthusiasm for itself to sink like some of Yes' more embarrassing transitional albums. At the same time, it's overall less tuneful than The Ladder or Magnification and less moody and compelling than their '70s work. But most of you probably knew that before hearing a note of Fly From Here (such is what you come to expect when you follow a band for this long), so the real question is: does this lineup of Yes have potential? They do. Will they someday fully tap into it? Your guess is as good as mine.